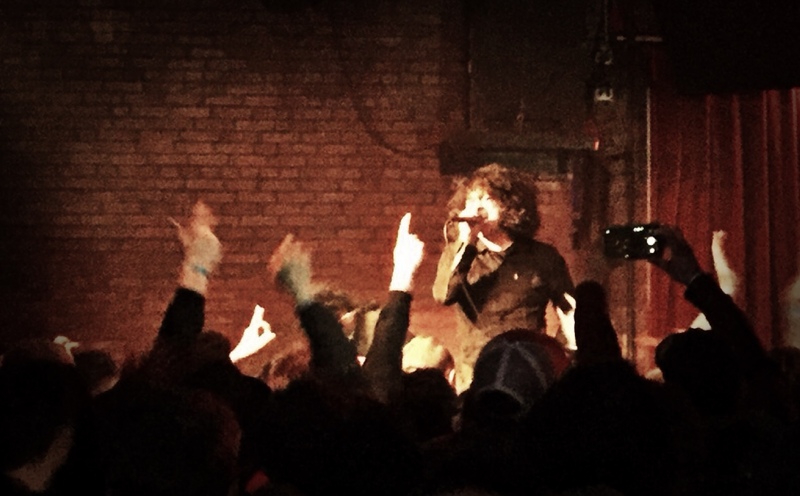 Selling out in a matter of minutes, At the Drive-In and Le Butcherette’s played a surprise show last night at Club Dada to warm-up for their forthcoming joint tour and a rumored surprise appearance at SXSW. A largely bespectacled crowd, many clutching PBR’s, filled the 400 capacity venue with a contagious enthusiasm. Both bands are already booked for an official tour date in June that plays Dallas’ Southside Ballroom, but the chance of seeing At the Drive-In at a club this size is rare indeed. As the crowd quickly filled the club, classical music played as we waited for Le Butcherettes. I think the band has had a different line-up supporting front-woman Teri Gender Bender each of the last three times I’ve seen them. This line-up is without a doubt the best (no disrespect to past members, I’ve never seen a bad Le Butcherettes show). The addition of drummer Alejandra Robles Luna adds considerable power to the band. She hits hard, but has just the right amount of finesse to balance it out. Riko Rodríguez-López added his multi-instrumental talents, switching between bass, guitar, and keyboards throughout the set. As usual, Teri Gender Bender was on fire. I’ve never seen a performance from her that wasn’t 100% effort and completely engrossing. Constantly shifting between dancing and seizure-like contortions, Gender Bender is a force to be reckoned with. The band played a 45-minute set that included tracks from their last two albums, Cry is for the Flies and A Raw Youth, and I think debuted some new material as well. Unless they were deep cuts from the earlier albums, they played two or three songs that I didn’t recognize. Le Butcherettes @ Club Dada, Photo by J. Kevin Lynch, 2017. At the Drive-In @ Club Dada, Photo by J. Kevin Lynch, 2017. Going on a little after 9pm, At the Drive-In kicked in to “Arcarsenal” and the crowd was at a fever pitch. Playing the majority of their classic album Relationship of Command, the crowd was in lockstep with the band song-for-song. Also playing tracks from In/Casino/Out, Vaya, and the forthcoming in•ter a•li•a, the band hardly sounded like they were knocking the dust off. Nope, they were in top form and the crowd on hand relished every minute of it. Cedric Bixler (he of boundless energy) engaged the crowd in sing-a-longs, fist-pumps, and more than once dove into their open arms. The band was collectively sharp in execution, any miscues were hardly discernible (or worth mentioning) due to the dynamic performance that was given. Omar Rodríguez-López anchored the band as Paul Hinojos (bass), Tony Hajjar (drums), and Keeley Davis (guitar) powered through the set. The band appeared to be having a great time, too. Feeding off the crowds energy, they seemed to enjoy the opportunity of playing a small venue as much as the crowd. We highly recommend checking out this tour when it kicks off Friday in New Orleans. Some fans may not be thrilled that this isn’t the original ATDI line-up. But, last night it didn’t matter. They sounded great.